Using the large holes of a box grater, grate zucchini into a medium bowl. If you have really juicy zucchini, make sure to drain out liquid by allowing it to rest in strainer, or wrap in a towel and squeeze liquid out. Add salt, lemon zest, chopped herbs, garlic, pepper, and eggs. Mix well to combine. Slowly add flour, stirring so no lumps form. Heat 2 tablespoons olive oil in a large saute pan over medium-high heat until oil sizzles when you drop a small amount of zucchini mixture into the pan. Carefully drop about 2 tablespoons zucchini mixture into pan; repeat, spacing fritters a few inches apart. Cook fritters until golden, 2 to 3 minutes. Reduce heat to medium. Turn fritters, and continue cooking until golden, 2 to 3 minutes more. Transfer fritters to a plate; set aside in a warm place. Cook remaining zucchini mixture, adding more oil to pan if necessary. Garnish with parsley sprigs and lemon wedges, if desired. Aioli: Combine 1/4 cup mayonnaise, 2 tbsp grainy dijon mustard, 1 tsp horseradish, juice of 1/2 a lemon, generous amount of freshly chopped herbs. Taste and season with salt and pepper. 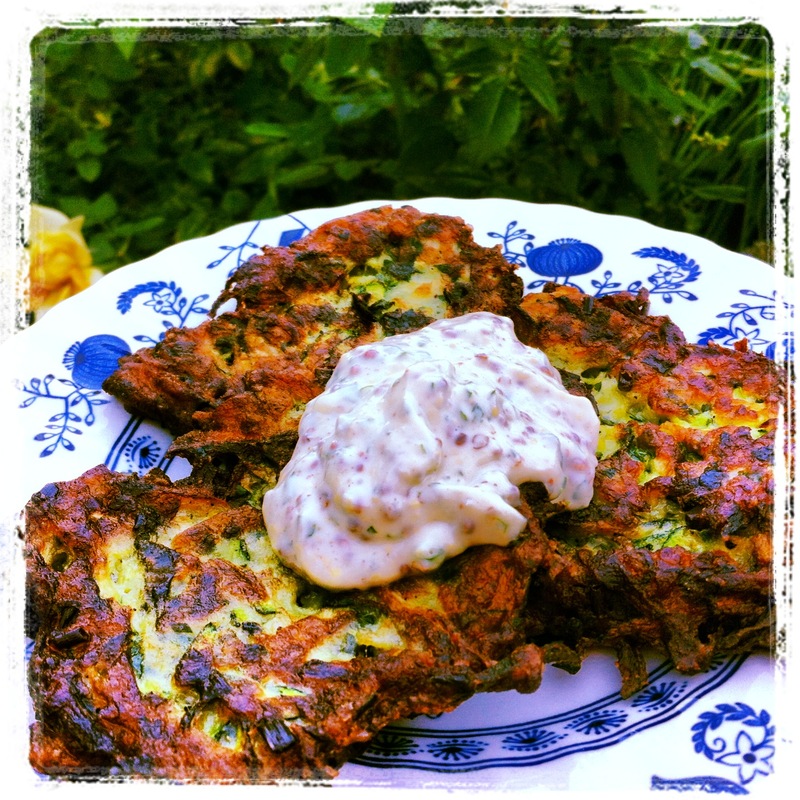 This entry was posted in Appetizers, Recipes, Vegetables and tagged aioli, fresh herbs, lemon, lemon herb aioli, side dishes, vegetables, vegetarian, zucchini, zucchini fritters by Chatty Kathy. Bookmark the permalink.